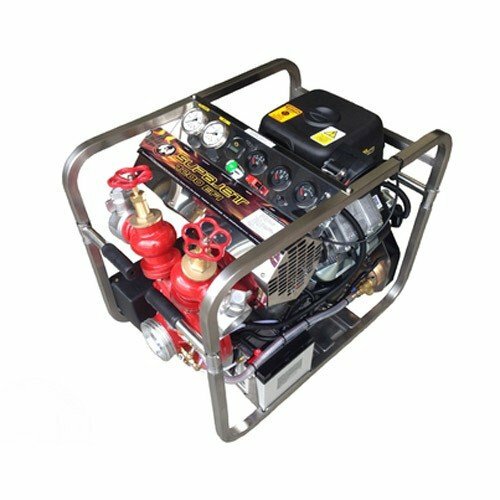 Is a powerful light weight portable fire pump that combines the benefit of high pressure fire fighting performance with optimum water transfer properties. Powered by the reliable air cooled V Twin engine the Vanguard 35HP. This 993 cc two cylinder engine develops 35 HP @ 3600 Rpm. Easily maintained through the worldwide Briggs & Stratton service dealer network to ensure maximum reliability. Fast and effective priming is provided by the simple to operate push button dry sliding vane type primer. The pump will prime 3 metres in 7 seconds and to a maximum of 7.2 metres. Exceptionally strong stainless steel frame with spring loaded handles to allow for multiple carrying positions. A stainless steel control panel allows for full instrumentation and operating controls from one location. 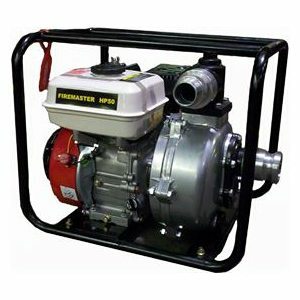 The pump comes with a wide range of standard equipment fitted. Discharge: Twin Screw down aluminium globe type with Brass Spindles. Discharge 64mm BI Couplings with pressure release. Volute Body and Head: Marine Grade Aluminium Alloy CC601 heat-treated To T6 Hardness. Impeller: Marine Grade Aluminium Alloy CC601 heat-treated to T6 Hardness fully enclosed. Wear Rings: Long Wearing Acetyl, Economical to replace. Pump Shaft and Seal: Stainless Steel Pump Shaft with spring loaded Mechanical Carbon / Ceramic Seal. Priming: Dry Sliding Vane Type With Electric Clutch, Fast And Easy To Use. Will prime 7m in 30 seconds. 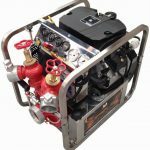 Briggs and Stratton Commercial Power, Vanguard VTwin air-cooled, overhead valve. Output: Maximum 35HP (25kw) @ 3600 RPM. 57 cu. In. Displacement: 993cc, 4 cycle. Full pressure lubrication. Twin 63mm screw down globe valves which will allow for a variety of coupling types. A large stainless steel fuel tank with capacity of 10.0 litres or the optional 12L Plastic fuel tank that ensures the fuel supply will last for up to 1 hour at maximum throttle opening. Electric starting is standard with a 12 – volt negative earth system. 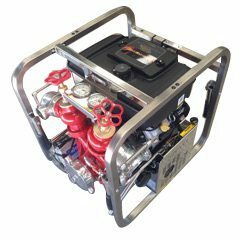 The battery is a 12V VRLA type and is completely maintenance free. This type of battery can stay fully charged for up to 12 months without the need for recharging. A sealed regulator and internal 16 amp alternator provides reliable power. A robust hand start allows the engine to be started in the event of low battery power. Extras include LED flood lighting. 1200 litre/minute at 7 bar means a fire service can run two 600 litre/minute hand line effortlessly. 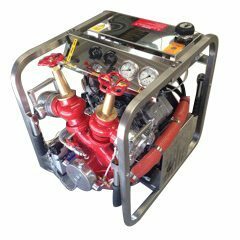 The powerful 993cc engine means that both urban and rural fire fighters can get maximum performance out of the 129Kg package (Fully operational including full fuel tank and oil). 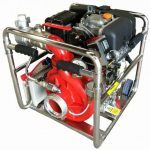 In situations where flow rate rather than pressure is needed the SupaJet 1200 delivers over 1700 Litres per minute (with flooded suction).